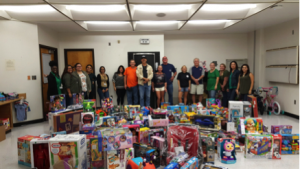 For more than a decade, the brothers and sisters of IAM Local 2061 at the Kennedy Space Center in Cape Canaveral, FL have been coming together to make a difference for the kids in the Sunshine State. And this year was no different. 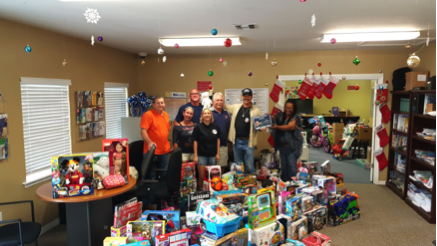 Joining forces with Brevard Family Partnership, IAM Members granted 300 kids a Christmas wish from their list. IAM Member Steve Ching of Local 2061 has been working as one of ‘Santa’s elves’ since the beginning. In the end, IAM members surpassed last years’ total numbers and raised more than $10,500. 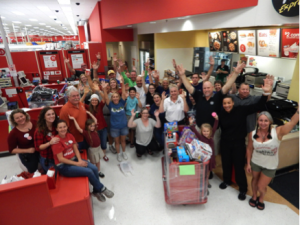 The Target store in Titusville, Florida joined in the activities by donating nearly $900 in gift cards and shopping discounts. Special thanks to the brothers and sisters of Local Lodge 2061, as well as Locals 610, 779 and District 166 for their donations. And of course, to those Machinists and their families who donated their time, money and compassion to this event. You are the reason we call each other Brother and Sister in the Southern Territory!